The Isuzu Faster is a pick-up truck that was manufactured and marketed by Isuzu between 1972 and 2002 over three generations. The Faster was succeeded worldwide by Isuzu D-Max worldwide, except in North America. Isuzu of Japan introduced the KB20 / 25 series Faster pickup in 1972. The regular wheelbase models were designated "20", while "25" referred to the longer version. Derived from the Isuzu Florian, the Faster shared many components, including doors and the front-end assemblage. It served as a replacement for the Isuzu Wasp, a pickup version of the Bellett which preceded the Florian. Both single and twin headlamp front fascia designs were produced. Due to the exterior dimensions, and engines offered were found to be in compliance with Japanese regulations, the platform was classed in the favorable "compact" designation, and competed with other Japanese made products sold in Japan at the time. In most export markets, Isuzu rebranded the Faster as the "Isuzu KB". However, the Faster was often distributed through General Motors (GM) retail channels and sold under the Chevrolet brand as the "Chevrolet LUV"—LUV being an acronym for light utility vehicle. Bedford, the European commercial vehicle subsidiary of GM also offered the vehicle under the "Bedford KB" name. The Isuzu Faster used a traditional pickup truck chassis with a ladder frame and a leaf spring live axle rear suspension. At the front, the A-arm suspension used an independent configuration. The 2,600 mm (102.4 in) wheelbase was similar to its competitors, as was the 1,855 mm (73.0 in) cargo bay. Unlike for the preceding Wasp, there was also a long wheelbase version (KB25) which had 2,995 mm (117.9 in) between the axles, which made for a 2,290 mm (90.2 in) bed. In 1978 a four-wheel drive version became available, with the KB40 chassis code but sold under the "Faster Rodeo" label in Japan. There was also a double cab (on the longer chassis) version. Sales ended in 1980 when the second generation was introduced. The engine used in most markets was a carbureted 1.6-liter (1,584 cc) gasoline SOHC inline-four of 94 PS (69 kW), which was complemented by a 2.0-liter (1,951 cc) diesel four (KBD) which produced 62 PS (46 kW). Top speeds were 145 km/h (90 mph) and 115 km/h (71 mph) for the gasoline and diesel versions respectively. In Japan, an overhead valve engine (G161) was fitted originally; this produces 84 PS (62 kW) for a 135 km/h (84 mph) top speed. General Motors-Holden imported the Faster into Australia from November 1972 under the name "Chevrolet LUV", renaming it "Isuzu KB" in 1977 before it was replaced in December 1980 by the second generation model (badged "Holden Rodeo"). Holden launched the LUV in Australia with the 1.6-liter inline-four gasoline engine delivering approximately 50 kW (67 hp) of power and 110 N⋅m (81 lb⋅ft) of torque. Gaining an early reputation for reliability and durability, these original rear-wheel drive models featured a four-speed manual transmission, short-wheelbase construction, and circa 1,000 kg (2,200 lb) payload capacity. An update in 1978 expanded the LUV range—now comprising the short-wheelbase KB20 model, the new long-wheelbase KB25 and the four-wheel drive KB40 short-wheelbase. These KB25 and KB40 variants were offered in both cab chassis and utility (pickup) body styles and could be specified with the 1.6-liter gasoline engine or the newly available 2.0-liter inline-four diesel. The diesel produced 45 kW (60 hp) and 113 N⋅m (83 lb⋅ft). Responsibility of sales in North America was delegated to General Motors. Thus, the Isuzu was retailed via Chevrolet dealerships as the "Chevrolet LUV". The only engine was a 1.8-liter (1,817 cc) SOHC inline-four which produced 75 hp (56 kW). Sales in the United States began in March 1972 as a response to the Datsun and Toyota pickup trucks, as well as Ford's Mazda-built Courier. To circumvent the 25 percent tariff on light trucks (known as the chicken tax), LUVs were imported in cab chassis configuration, which included the entire light truck, less the cargo box or truck bed and were only subject to a 4 percent tariff. Subsequently, a truck bed would be attached to the chassis and the vehicle could be sold as a light truck. The LUV's exterior was updated slightly for the 1974 model year, but the first major update came in the 1976 model year, when a three-speed automatic transmission option and front disc brakes were added. Power was up to 80 hp (60 kW) for 1977, and sales continued to rise. An exterior refresh and the addition of a 2,285 mm (90 in) cargo bay option, with longer 2,995 mm (118 in) wheelbase, brought sales up to 71,145 in 1978. The addition of four-wheel drive for 1979 brought the LUV to the attention of Motor Trend magazine, and earned it their second "Truck of the Year" award. The LUV was the first four-wheel-drive minitruck available and set a new trend. Sales peaked at 100,192. The second generation was more commonly marketed worldwide under the Isuzu label (either as the "Isuzu KB" or just plain "Pick Up"). It continued to use the "Rodeo" suffix for the four-wheel drives. The second generation model was the first Isuzu pickup offered in three cab styles: single cab, double cab and "Space Cab" ("Sports Cab" in some markets). Sales in the UK continued as the Bedford KB. This generation was not shared with the GM North American GMT325 platform, which replaced the North American Chevrolet LUV in 1982. Holden in Australasia distributed the second generation Isuzu Faster between January 1981 and August 1988 as the first generation or KB series "Holden Rodeo", for which production started in December 1980. Early KBs were fitted with circular headlamps and a horizontal four-bar grille, but a 1983 model year facelift in December 1982 brought rectangular lamps with a 12-port grille insert as well as restyled side mirrors. At launch, Holden made the Rodeo available in utility (pickup) and cab chassis body variants in both rear- (LWB) and four-wheel drive (SWB) layouts. All models featured a floor- or column-mounted four-speed synchromesh manual transmission coupled with the 1.6-liter gasoline or 2.0-liter diesel engines. The 1983 model year update increased these displacements to 1.8- and 2.2-liters, respectively. At the same time a new upmarket "LS" model was issued (coded KB28), fitted with a 2.0-liter gasoline engine and five-speed manual. For the 1984 year model, beginning in February 1984, the 2.0-liter became the base gasoline engine. The 1985 model from July the same year signaled another facelift, the release of the two-door Space Cab body style, the debut of a new 2.3-liter gasoline engine, and the deletion of the four-speed manual and column-shift selector (making the floor-mounted five-speed manual standard). From March 1986 (1986 model year), the 2.3-liter became the standard gasoline engine and in April the subsequent year, the 1987 models obtained a final facelift with an open rectangular grille design and optional power steering. Versions with unique local specifications were assembled in New Zealand at GM's Trentham assembly plant. These were also badged, Holden. While the British buyers still knew the car as the Bedford KB, continental markets mostly saw the second generation KB with Isuzu badging. Specifications and trims varied depending on market needs, but most received the 1.6-liter G161Z petrol engine with a twin carburettor and 80 PS (59 kW), or the 2-liter C190 diesel inline-four with 55 PS (40 kW). Two-wheel-drives were also available on a long wheelbase not offered in combination with four-wheel-drive. The United States continued to receive the Faster under the "Chevrolet LUV" name for the second generation, introduced in 1980 for the 1981 model year. The gasoline engine remained the same, but the LUV was now available with an Isuzu C223 diesel engine making 58 hp (43 kW) at 4300 rpm and 93 lb⋅ft (126 N⋅m) at 2200 rpm. This new engine gave the rear-wheel drive diesel LUV a fuel economy rating of 33 mpg‑US (7.1 L/100 km) city / 44 mpg‑US (5.3 L/100 km) highway. After the 1982 model year, General Motors stopped selling the Chevrolet LUV (although many '82s lingered on forecourts into the next year) in the United States in favor of their own S-10 compact pickup. 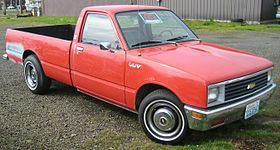 Meanwhile, Isuzu had sold their version in parallel with the LUV since their 1981 entry to the US market, under the name "Isuzu P'up" (short for "pickup"). 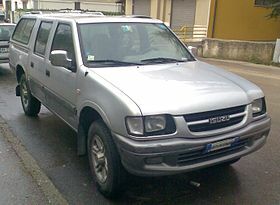 Isuzu's version received another grille and other differences to set it apart from the LUV, not the least of which is the giant "ISUZU" block letters on the tailgate. The P'up received the same engines as the LUV; either a 80 hp (60 kW) 1.8-liter gasoline inline-four (G180Z) or a 2.2-liter diesel version with 58 hp (43 kW) (C223). Four-wheel drive was available with either engine but only in short-wheelbase form, though some 4WD long-wheelbase diesel are known to exist, possibly dealer-installed or aftermarket conversions. Because of technology-sharing agreement between GM and Isuzu, the diesel was also offered with the LUV's replacement until 1985. As with North America, the Isuzu Faster was issued under the name "Chevrolet LUV" in South America. Manufactured in Colombia from Japanese complete knock down (CKD) sets, these models entered production in 1980 to be exported to other South American countries, continuing on until the release of the TF series in 1988. At the start, the versions assembled were the K-26 and K-28. It was offered with a 1584 cm³ (G161Z) engine. It was also offered a (C190) diesel version of 1951 cm³ with eight valves in the cylinder head and 62 hp (46 kW). This model of the Isuzu KB only was assembled in Chile via CKD kits from Japanese origin. For the third generation (TF), introduced in 1988, the domestic Japanese lineup was divided into two, with the "Faster" label used on rear-wheel drive versions with four-wheel drives now sold as the Isuzu Rodeo. Rodeo became the name used in most markets for this car, but the profusion of labels for different markets continued. Versions sold in the Americas were called Isuzu Pickup and Chevrolet LUV. In the United Kingdom, the pickup was called Isuzu TF and also Bedford Brava from 1988 until 1991 when the Bedford brand was dropped and it became the Vauxhall Brava. The Isuzu was also sold in mainland Europe along with the Opel Campo. This Opel branding was also utilized in the Middle East, parts of North Africa and some Asian countries. Holden Rodeo was the only name used in Australasia, with the Isuzu KB name used in South Africa and some other markets. The names Isuzu Faster-Z, Isuzu TFR, and Honda Tourmaster were used in Thailand. A Thai-market SUV based on the TF was sold as the Thairung Adventure, produced in semi-knocked-down by Thai Rung Union Car. Names used in other markets include: Chevrolet T-Series (Egypt), Isuzu Ippon (Israel), Isuzu Fuego (Philippines), and as the Isuzu Invader in the north-eastern parts of Malaysia (Sabah). License built copies have been sold as the Jinbei SY10 series, Foton Aoling T-Series in China, where the car has served as a basis for innumerable local copies, authorized and unauthorized. In Japan, two-wheel drive versions were called "Isuzu Faster", with the "Rodeo" name reserved for four-wheel drive units. In 1992, an updated version of the 4JB1 2.8-litre turbodiesel with direct injection was introduced; while the original 2.8 has 100 PS (74 kW), the direct-injected version offered 110 PS (81 kW; 108 hp) at 3,600 rpm and 23.0 kg⋅m (226 N⋅m; 166 lb⋅ft) of torque at 2,300 rpm. Japanese sales ended in 1994 without replacement, although export markets continued to receive the vehicle until replaced by the D-Max from 2002. The TF series received a facelift in 1997. Styling was changed, with a more rounded look at the front, and a new-look dash similar to that used in the 1995 to 1997 model Isuzu Wizard. In China, where the TF is still built by Isuzu's local joint venture partner Qingling Motors, it received a second facelift at the beginning of 2015. Holden introduced the TF series into Australia in 1988, branded as the Holden Rodeo, following on from the name of the previous Isuzu based light truck sold by the brand in Australia. The Holden Rodeo was initially available with a 2.6-liter 88 kW (118 hp) inline-four. A 2.8-liter 74 kW (99 hp) turbodiesel was introduced soon after. Body styles offered were a two-door single cab, a two-door SpaceCab, with space for two small jump-seats (rarely if ever fitted in Australia) behind the front passengers, and a four-door Crewcab, with space for the driver and four passengers. Several trim levels were available, which included DX (base model), LX (mid-range RWD, top of the 4WD range) and LT (top of the range, only available as an RWD petrol Crewcab). The facelifted 1997 (1998 model year) Holden Rodeo came with a new trim level, LT Sport, available as a four-wheel Crewcab only. Airbags for the driver and front passenger also became an option. By 1998 the 2.6-liter engine was discontinued and a new engine was offered, a 3.2-liter 140 kW (188 hp) V6. This engine was available in both rear- and four-wheel-drive. The rear-wheel-drive version had the same chassis, and thus ride-height as the four-wheel-drive, but without the transfer case and front axle. The 3.2-liter V6 was the most powerful engine in a pickup truck in Australia until it was replaced in 2003 by the new look Rodeo based on the Isuzu D-Max. Accordingly, this engine was the most popular engine in the Rodeo, and the Rodeo sold very well overall, near the sales numbers of the Toyota Hilux, traditionally the best-selling commercial vehicle in Australia. The Holden Rodeo was updated once again in 2001 for the 2002 model year, with a new diesel engine, a 3.1-liter 96 kW (129 hp) direct injection intercooled turbodiesel. The update was also accompanied by minor styling changes, such as clear indicator lenses, and a different grille. In Europe, the Isuzu was sold as the TF alongside the rebadged "Opel Campo". It was also sold as the "Isuzu Campo." In the United Kingdom "Vauxhall Brava" badging was used rather than Opel. These received the same updates as did the Isuzu TF in general markets, and a variety of body styles were available, usually coupled with diesel engines. In North America, the TF series appeared in 1988 as simply the "Isuzu Pickup". Produced at Lafayette, Indiana, Isuzu continued on with the TF until 1996 when it was finally replaced with the Hombre (a badged-engineered Chevrolet S-10). The only engines available were the 96 hp (72 kW) 2.3-liter 4ZD1, the 120 PS (88 kW; 118 hp) 2.6-liter 4ZE1 and the GM 3.1-liter V-6 (designation LG6) producing 120 hp (89 kW) and 170 lb⋅ft (230 N⋅m) for the '91–'94 model years. This truck holds the distinction of becoming the last carbureted passenger vehicle sold new in the United States (1994 model year). As with the previous KB series generation, South American markets again received the TF models under the "Chevrolet LUV" name. The Chilean assembling works began in 1982, meanwhile in Colombia commenced in 1989, In the assembling process, the local parts usage percentage was high and important for the LUV manufacturing process. In Chile it has to reach 40 percent domestic parts content, meanwhile in Colombia exceeded 70%. A successful export program beginning in Chile in 1980s to the Andean Community countries: Bolivia, Ecuador and Venezuela; and in 1993 began the exports from Chilean assembled units (in the SpaceCab model only) to Bolivia, Peru, Argentina, Mexico, Uruguay, Paraguay, Colombia, and Venezuela. In total, more than 220,000 units were produced only in Chile, and more than 300.000 in Colombia. From 1999 and to little success, Thai Rung Union Car supplied the Chevrolet plant in Arica, Chile with the unique body panels from their "Isuzu Grand Adventure" model to make the Chevrolet Grand Adventure and the "Chevrolet Grand LUV". The Grand Adventure was a wagon version of the TF series pickup. By the late 1980s, supplementary assembly began in Quito, Ecuador by Omnibus BB Transportes (now General Motors Ecuador) with a 1.6-liter inline-four cylinder engine, making 80 hp (60 kW). In October 2005; was ceased the Isuzu Faster Chilean manufacture. In Colombia, the Isuzu Faster has ceased its production in 2010. The last Faster rolled off the assembly line on May 8, 2010. In both countries, the Isuzu Faster was replaced by the Isuzu D-Max, these firsts units were assembled only in Ecuador and later from vehicles coming from Thailand (2014 onwards). ^ Ruiz (1986), p. 131. ^ a b "Chevrolet Colorado History". Edmunds. Retrieved 6 May 2011. ^ "Bedford KB (KB25) brochure (Europe, left-hand drive)". Bedford Vehicles. Retrieved 9 October 2011. ^ "自動車ガイドブック" [Japanese motor vehicles guide book] (in Japanese). 20. Japan: Japan Automobile Manufacturers Association. 30 October 1973: 230. ^ a b Bebbington (2009), p. 279. "KB Rodeo: December 1980 to August 1988"; "GM-H had been importing light and heavy Isuzu trucks from Japan since the early 1970s. First of these was the Isuzu KB utility, sold as the Chevrolet LUV (Light utility Vehicle). The reputation and recognition of this little utility grew over time until in 1977, the Chevrolet name was deleted and the Isuzu nameplate was used instead. Late in 1980, KB received a major facelift [redesign]. With new sheetmetal, the opportunity was taken to re-badge the car yet again – this time as Holden Rodeo." ^ "Holden Rodeo – Used Car Research". GoAuto. John Mellor. Archived from the original on 7 October 2011. ^ a b c d e f "Holden Rodeo (Isuzu Utility)". GoAuto. John Mellor. Retrieved 8 May 2011. ^ Ikenson, Daniel (18 June 2003). "Ending the 'Chicken War': The Case for Abolishing the 25 Percent Truck Tariff" (PDF). Cato Institute. Retrieved 13 April 2016. ^ a b Gandy, Jim (1982-05-03). "Life with the P'UP". Autoweek. Vol. 32 no. 18. Crain Press Inc. p. 24. ISSN 0192-9674. ^ a b c d Bebbington (2009), p. 280. ^ Bebbington (2009), p. 279–280. "These early series Rodeos could be identified by: the simple horizontal-slat grille design, round headlamps and central Holden lion logo. "; "In late 1982, Rodeo received a facelift with a bold new twelve-segment grille and rectangular headlights." ^ Bebbington (2009), p. 279. "Initially, Rodeo was sold in utility (pick-up) and cab chassis body styles, with a choice of two or four-wheel drive. All versions were offered with a 1600cc petrol or 2000cc diesel powerplant. The transmission was a 4-speed all-synchro manual gearbox with floor or column shift." ^ Bebbington (2009), p. 279. "Tagged the 1983 year model, it featured increased basic engine capacities – 1800cc petrol and 2200cc diesel. The upmarket LS model (coded KB28) has a 2000cc petrol engine, coupled to a 5-speed manual transmission." ^ Bebbington (2009), p. 279. "The next update was the 1984 model released in February of that year, with further model proliferation. The 2000cc petrol engine became the base powerplant and the 2200cc diesel remained the option." ^ Bebbington (2009), p. 279. "With yet another facelift, the 1985 model range was broadened to include the Space Cab – a 2-door utility with a slightly extended cabin, providing extra storage space behind the seats. Also for 1985, a new 2.3-liter petrol engine was added to the range. [...] In 1985, the 4-speed manual gearbox and column-shift selector were deleted. All Rodeos now had a 5-speed floor-shift manual transmission as standard." ^ Bebbington (2009), p. 279. "In 1986, the range was altered again, with the 2.3-liter petrol engine now fitted as standard equipment across the board. The following year, the KB series Rodeo received its final facelift, identified by the distinctive open rectangular grille design." ^ Bebbington (2009), p. 280. "Power steering available from 1987". ^ Lamm (1981), p. 108. ^ "Isuzu. Isuzu in the Philippines". Car-cat.com. Retrieved 25 July 2010. ^ "China intensifies car competition in Philippines". Gasgoo. 10 April 2013. Retrieved 1 September 2016. Bebbington, Terry (2009). 60 Years of Holden. Padstow, New South Wales: Haynes Manuals. ISBN 1-876953-58-6. Lamm, Michael (July 1981). "Driving the Isuzu I-Mark and P'up". Popular Mechanics. New York City. Ruiz, Marco (1986). 'The Complete History of the Japanese Car: 1907 to the Present. Rome: ERVIN srl. ISBN 0-517-61777-3. Wikimedia Commons has media related to Isuzu Faster. This page was last edited on 21 April 2019, at 14:07 (UTC).